Erin and Scott were married at The Barn at Twin Oaks Ranch on September 16, 2017. Their theme was equal parts rustic and elegant, and their color palette was a beautiful combination of dusty rose, sage green and champagne. Their photos were taken by Southern Belle Snapshots, who so beautifully photographed their big day! One of the prettiest details from this wedding was the bride's gorgeous gown. It was from David's Bridal, and it was covered in beautiful detailing! The lace and ruffles fit perfectly with the rustic-elegance theme of their wedding. The bridesmaids wore floor-length dresses, also from David's Bridal, in a dusty rose hue, which also fit in flawlessly with the wedding's theme and color palette. The guys looked casual (but super handsome!) in jeans, white button up shirts and vests - the absolute best look for a rustic wedding. This bridal party was rustic wedding goals! Two of the best dressed people in this bridal party were the little ones: I'm crazy over the flower girl's white lace, vintage inspired dress... and well, it doesn't get much more adorable than this little Ring Security guy! Some of Erin's favorite details from her wedding day were the florals. I'm crazy about the dahlias and pops of pink and purple in their bouquets! Their florals had such sweet, just-picked, wildflower vibes, which couldn't have been prettier with the rustic-meets-elegant details of their day. Erin and Scott's ceremony details were lovely and romantic. Their altar included beautiful taupe draping and three large floral arrangements. Their aisle was lined with mason jars filled with sweet, small arrangements, and they also had the cutest little guestbook table set-up. 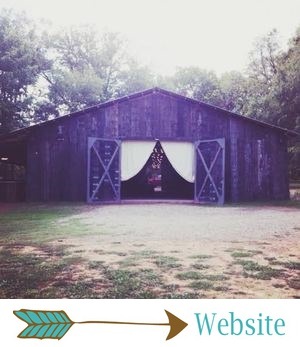 Erin said her favorite thing about getting married at The Barn was "the beauty of the place." Early fall at The Barn is so beautiful, and it provides the loveliest backdrop for outdoor ceremonies. Erin and Scott's ceremony was absolutely perfect and full of love! Erin said one of her favorite moments of the day was "walking down the aisle to Scott and seeing the look on his face." Erin and Scott's reception was rustic, elegant and romantic. Their tables included champagne tablecloths, simple place settings with rose colored napkins, and the prettiest florals in various vases. Their cake was super simple, but it was gorgeous, and I loved their pretty pink cupcakes! Two of the most fun details from their reception: koozies and moonshine favors! Erin said she will also always remember some of the highlights of their gorgeous reception: "The first dance and when my wonderful husband shoved cake in my face," she said. "The whole night was just filled with so much love, it was amazing." After their reception (which included a precious first dance with their son), the newlyweds left for a cruise to Cozumel and Progresso! Erin said she was very happy with how the Twin Oaks Team performed during her wedding planning season and on her wedding day: "They did wonderful! More than what I could have asked for," she said.